The 1040EZ is a simplified form used by the IRS for income taxpayers that do not require the complexity of the full 1040 tax form. Simply select your tax filing status and enter a few other details to estimate your total taxes. Based on your projected tax withholding for the year, we then show you your refund or the amount you may owe the IRS next April. Please note this calculator is for tax year 2019 which is due in April of 2020. We also offer 1040 EZ calculators for tax years 2018 & 2017. Important: If you are trying to estimate what you will owe in April of 2019 (or October of 2019 for filers who are filing an extension), please use our 2018 tax calculator. Mortgage Interest Deductiblity Limit: In the past homeowners could deduct interest paid on up to $1,000,000 of mortgage debt. The new limit on new mortgage originations is $750,000, though homeowners who are refinancing an existing mortgage may still qualify for the old limit. Home Equity Interest Deductibility: In the past second mortgage interest was deductible. Interest paid on HELOCs and home equity loans is no longer deductible unless it is obtained to build or substantially improve the homeowner's dwelling. SALT Limit: High-income filers who own homes in expensive coastal areas will find their state and local tax deductions have been limited significantly, to a cap of $10,000 per year. Tax time begins at the end of January into February, and for many people, this means they have to decide if they're going to file on their own or ask a tax professional for help. If you're filing for the first time, you might feel a little anxiety about the process because a small mistake can mean a huge headache in the future. This article will go over everything you need to know about filing your taxes. We will talk about the documents you need and why you need them, standard deductions, tools, and software to assist you in this process, as well as what to do if you overpay or end up owing money to the Internal Revenue Service. We'll also talk about what places you can go to have a tax professional do it for you, and why this is a good option to consider as well. As you're getting ready to start the process of filing your taxes, it is helpful to have all of your information in one place. Having everything in one place will save you time when you sit down to file, as well as keep your stress levels down. If you're filing by yourself, you can just make copies of the document's you'll need and keep them in one place. 1099 Form. If you use a savings account, or if you earned income from something like a freelance writing job from a content mill and it wasn't reported by an employer, you'll get a 1099 Form in the mail. This form will be used to add up your income level over the past year. If you work in several different places, it helps to make a master list and cross them off as they come in so you can be sure you got them all. 1098 Form. The 1098 Form is used to track your various interest deductions. If you paid any in student loan interest or mortgage loan interest, you'd get one of these forms as well. You will use these two forms to help fill out your 1040EZ. W-2 Form. Each of your jobs you worked at during the year will send you a W-2. This will have everything you earned over the past year, as well as any taxes that were taken out. It is a good idea to make a list and check that you got all of your W-2s if you worked multiple jobs. Every employer has until January 31st to get your W-2 forms in the mail. They can send them sooner, but most wait until the end of January. If you're expecting multiple forms, make a list and keep track of the ones you receive. Once you get them, compare them to your pay stubs and check for errors. If you find an error, the employer that made the error will have to give you a corrected W-2. The 1040 EZ form is one of the more basic tax forms to file, and there is less information you will need to complete it. You must have an annual taxable income of less than $100,000 and have no dependents. You can also only file as single or jointly with your spouse. To file successfully, you will need the documents listed below. The 1040 EZ form is the easiest form out of the four main forms you can fill out for your taxes. It has four sections, and you fill in the information you gathered from the above lists. The first section of the 1040 EZ form is your personal information. You will need to fill in your full name, social security number, address, telephone, birthday, and your filing status. If you plan to file a joint return with your spouse, you will need the same information from them as well. This section is where you add any payments you have made by paying Federal taxes. You also add any employment interest credits, as well as any earned income credit you can claim. The final section to the 1040 EZ is where you calculate your refund. If your payments and credits are higher than your total, you overpaid and can get a refund. If you find you've underpaid, you will have a balance due that you pay to the IRS. If you need a clearer picture of the form broken down by sections, click here. There are many different types of deductions a person can claim on their taxes. These often influence how much you can expect in your refund, so it is a good idea to look them all over carefully and choose the ones that suit your needs. Casualty, Disaster, or Theft. If you were a victim of a natural disaster like a flood, tornado, or hurricane this past year, you could deduct the expenses. You can add things related to your home, vehicle, and various household items as deductions. Dental or Medical Expenses. Did you pay out of your pocket for dental or medical care? If you did, you could add these to your deduction list. The maximum amount you can claim is the amount that goes over 10 percent of your annual income. Education Expenses. If you took a class or several classes to improve your skill set over the years, you might be able to deduct it. You can include things like books, course fees, lab fees, supplies, tuition, and certain travel expenses. 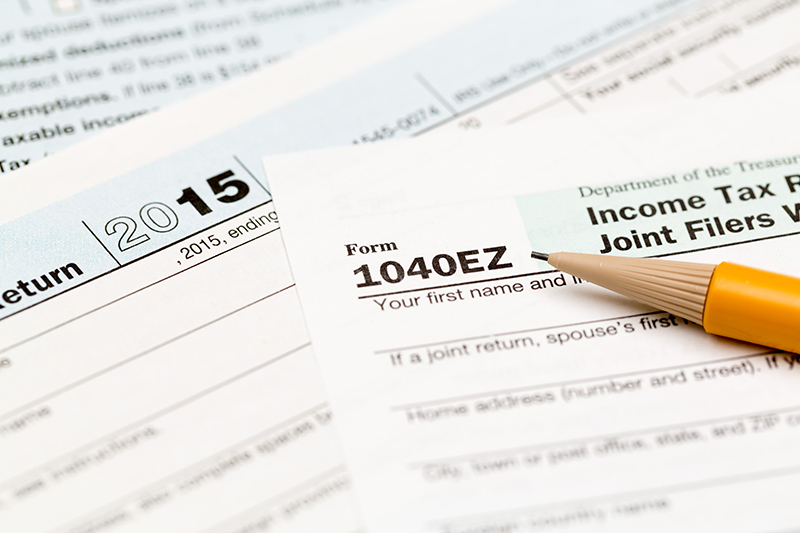 What is the Difference Between the 1040 and 1040 EZ Forms? 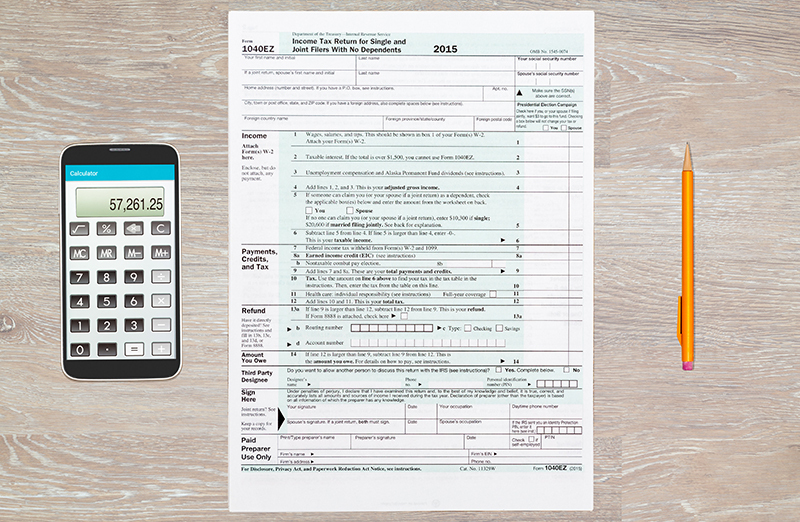 The 1040 form is a little more complicated than the 1040 EZ to fill out. This form will let you claim more deductions and tax benefits than the 1040 EZ, and that is the main difference. 1040 Form. The 1040 Form is the one you would choose if your annual income was below $50,000 and if you have a spouse, this means both of your combined incomes are below that level. If you have income from the sale of property, or if you have alimony, this is the correct form to use. 1040 EZ Form. The 1040 EZ Form has the same income limits as the 1040. Neither yourself or you and your spouse's income can go over $50,000 a year. If you have no dependents and an interest income that is below $400 per year, this form is for you. If you would like more in-depth information and what you can and can't claim on each of these forms, as well as information on the 1040a form, click here. If you've decided to file on your own, there are several popular tax software choices available to guide you through the process. Each one has different options available, but they all offer free versions for basic tax filing needs. FreeTaxUSA is a very straightforward and affordable software option. It will let you upload prior year's tax paperwork from competitors, and will walk you through the filing process step by step. There is a Basic version for free with Federal taxes, and to upgrade to Deluxe will cost $6.99. However, if you're planning to file state taxes, it will cost an additional $12.95. H&R Block has tax filing software as well. You can import your tax data from competitors, and it'll fill in your forms from that information. There is a free version along with two paid versions. The paid versions are Deluxe and Premium, and they cost $54.99 and $79.99, respectively. TaxSlayer offers a free version for the 1040EZ form only. You have the option of preparing and filing your taxes from any device from a desktop to a tablet with ease. This software comes with a 100 percent accuracy guarantee, and there are mistakes they will reimburse you for any fees or penalties. TaxSlayer offers four versions with the first being the free Basic package. The Classic version is $22.00, and the Premium version is $40.00. The final version is for Self-Employed and costs around $55.00. TurboTax is perfect for anyone who doesn't use technology as well. It will import and fill in all of your W-2 information, as well as your 1099s. There is an extensive question and answer section that you can access if you get stuck, and if you choose one of the paid versions, you can have a one-on-one video chat with a tax preparer. TurboTax offers a free version, Deluxe version for $54.99, Premier for $79.99, and a Self-Employed version for $114.99 per year. If you don't feel comfortable filing on your own, several agencies will fill out the forms and file them for you. Your local H&R Block or Jackson Hewitt have offices that you can schedule appointments with a tax professional. You should also check with your bank or credit union because they will often file your taxes for you at no cost. After you schedule your appointment, bring all of your documents, forms, proof of health insurance, and driver's license with. Your tax professional will go over all of your information and input it into your forms. They will submit them for you, and you pay the filing fee. You can track your refund online or on your smart phone. They also offer liability, and if there are mistakes on your returns, they will pay them. These two mistakes are very common. They are also relatively easy to fix once you realize there has been a mistake. Overpayment. If you realize you have overpaid your taxes and the IRS owes you a refund, you can fill out the Form 1040X and submit it to the IRS via fax or mail. If you're expecting a refund on the current year, wait for that to come in before you file the 1040X form. This can take 8 to 12 weeks to process. There is a three-year time limit, and this has to be filed on paper. Overdue Taxes. Another common issue is owing overdue taxes. If you know you're going to owe the IRS money, pay as much as you can right away. The IRS will add penalties and fees on for each month you are late and have an overdue balance. These fees can be up to 25 percent of your overdue balance. You can also call and set up payment arrangements to pay off the balance you owe. If you ignore this, they can garnish your wages, and there is also a three-year jail term that they can impose. Filing an Extension. You can file an extension to ask for up to six extra months to submit and pay your taxes. You can do this by downloading Form 4868 and submitting it as soon as you know you're going to need an extension. This will prevent any extra fees or penalties from being added to your existing balance. This article has covered all of the documents you will need to file your taxes, as well as the different forms you can fill out. We went over the sections of the 1040 EZ form, and what you can and can't claim with it. We touched on different tax filing software, and places you can go in person to have a tax professional help you. We talked about what to do if you overpay or owe money on your taxes, and how to file an extension. If you follow the advice from this article, you should be able to ease some of your anxiety about filing your taxes.